For the week, the S&P 500 rose +0.09%, the Dow Industrials gained +0.36% and the MSCI EAFE (developed international) advanced +0.70%. The Federal Reserve's September policy decisions and communications last week were largely as expected, with no change in short-term interest rates and confirmation that the Fed's balance sheet normalization plan will commence in October, following the path laid out at the June FOMC meeting. Policy committee members cited continued strength in the labor market and moderate economic growth as the deciding factors. Regarding future interest rates, FOMC participants continue to expect one more federal funds rate hike this year, and three further interest rate increases in 2018. Chart 1 shows that longer-term rate estimates were revised slightly lower, with 20bps shaved off of 2019 and the long-run estimate moving from 3.0% to 2.75%. 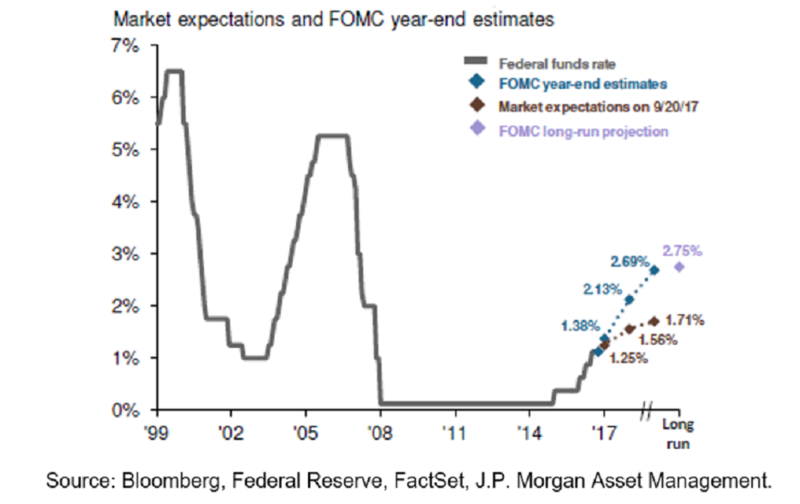 While policy outcomes were largely as expected, the path laid out for interest rates and the balance sheet, combined with a weak dollar and the potential for a more expansionary fiscal policy, may apply more upward pressure on long-term bond yields than seems priced into the market. According to J.P. Morgan, the Fed’s communications suggest a more hawkish path of policy actions despite the dovish tone and careful wording by Fed Chair Janet Yellen's comments.